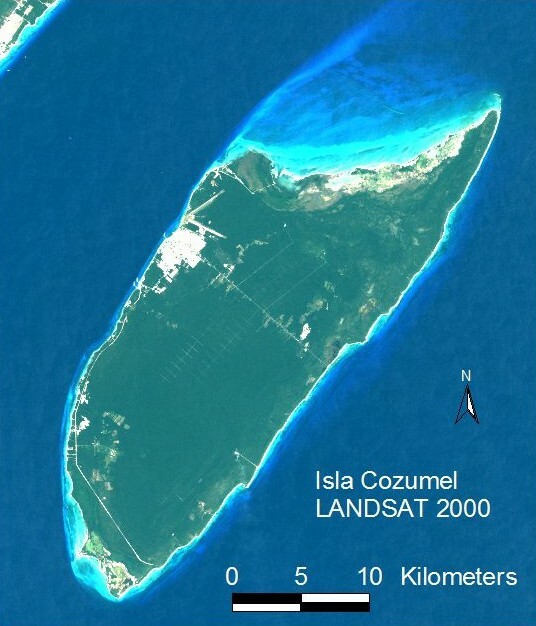 False color composite image of Isla Cozumel, shot by LANDSAT 7 satellite on 20 January 2000. The mainland city of Playa del Carmen, Quintana Roo, appears at the extreme upper left. On Cozumel, the town of San Miguel is visible as the white area in the island’s northeast, adjecent to the airport’s prominent runways. The smaller village of El Cedral in the southwestern interior is surrounded by argicultural fields. Most of Cozumel’s resorts and hotels are along the west coast both south and north of San Miguel. Also visible on Cozumel are the paved roadways that cut across the center of the island (the ‘transverse’ road) and continue around the southern perimeter. The grid of roadways in the center of the island constitutes the freshwater catchment system. Vegetation over most of Cozumel consists of semi-deciduous tropical forest. The northern edge of the island and the extreme southern tip both include areas of mangrove swamp. Mayan population flourished in Terminal Classic and Postclassic periods. Aboriginal population reached its peak in Late Postclassic (or “Decadent”) period (A.D. 1250 – 1519). The island was an important pilgrimage center focusing on the goddess Ix Chel. Most prominent ruins: San Gervasio, in north-central part of the island. In 1511, a Spanish ship commanded by Enciso y Valdivia was wrecked south of Jamaica. A small group of survivors drifted for 2 weeks in a small boat before landed on one of the islands off the Yucatán Peninsula; many authorities assume that this island was Cozumel, although some uncertainty remains. At least five of the survivors from the group, including Valdivia, were sacrificed by the Maya. Two members of the crew subsequently escaped and made their way to the mainland. One, Gonzalo Guerrero, married a Mayan woman, became a cacique, and later fought against his countrymen. The other, Geronimo de Aguilar, a priest, lived as a slave. On 3 May 1518, Spanish explorer Juan de Grijalva reached the coast of Cozumel and claimed the island for Spain. On 5 May, his group celebrated the first Catholic Mass in México, an event that is celebrated annually on Cozumel. Departing from Cuba, Cortés and his fleet landed at Cozumel in 1519, in the first stage of the conquest of México. The Spaniards spent a month on the island while repairing their ships; during this time, they destroyed many of Mayan temples on the island. Before proceeding to Tabasco, Veracruz, and eventually to Tenochtitlán, Cortés rescued Geronimo de Aguilar, who became a valuable interpreter for the conquistadores. After requesting permission from the King of Spain in 1525 to expand the colonization of the Yucatán, Don Francisco de Montejo arrived on Cozumel on 29 September 1527. He gave the island the Christian name of San Miguel de Cozumel. By 1570, the Mayan population was reduced by smallpox to fewer than 300. By 1600, the island was virtually deserted. During the 17th and 18th centuries, pirates such as Henry Morgan used Cozumel as a base for forays throughout the Caribbean. After 1848, Cozumel’s resident population rebounded as people fled the War of the Castes on the Yucatán Peninsula. The town of San Miguel received mestizo refugees, while Maya refugees settled in El Cedral. Cozumel developed only slowly thereafter, receiving only a temporary economic boost during WWII when the United States constructed an air base for use by planes patrolling the western Caribbean for German submarines. The continuing tourism boom began after films by Jacques Cousteau promoted the island’s diving resources in the 1960s.